Successfully Added HK Warehouse UMi Max Smartphone - Android 6.0, 4G, Octa-Core CPU, Mali-T860 GPU, 3GB RAM, 5.5 Inch FHD IPS, 4000mAh (Silver) to your Shopping Cart. 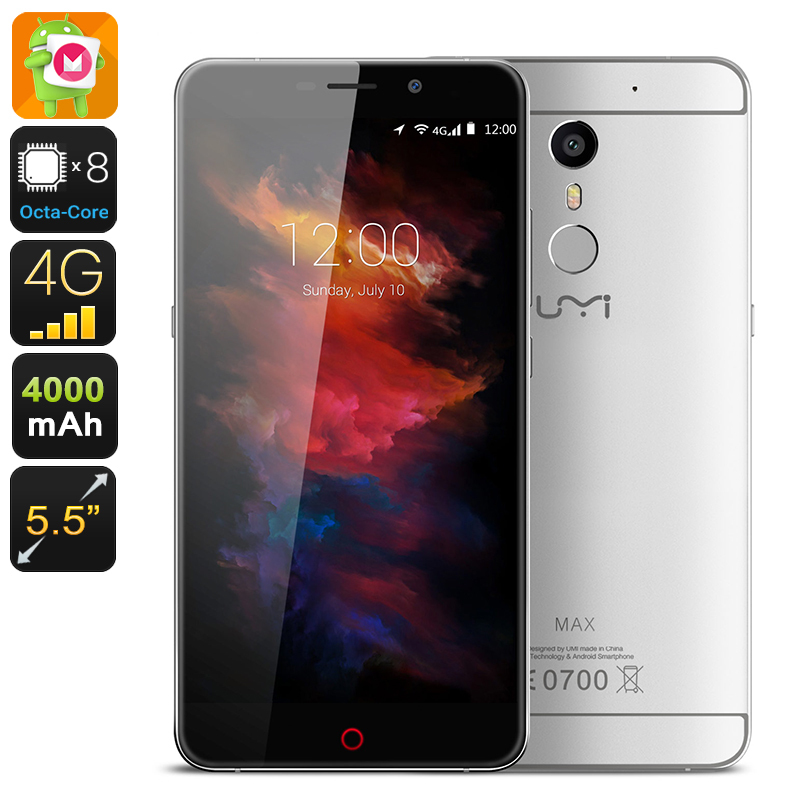 Under the hood the UMi Max lays an octa-core processor clocked at 2.0GHz, a Mali-T860 GPU, and 3GB of RAM. With this powerful hardware you don't need a professional gaming console to have a high-impact gaming experience. Stunning visual effects will take your gaming and entertainment experiences to an entirely new level. Its 16GB of internal memory can be expanded additionally up to 256GB through the provided Micro SD card slot for all your storage needs. The UMi Max offer the best way to bring along all your music, photos, videos, and games in one single device without ever having the fear of running out of storage space ever again. With its elegant design this smartphone surely is a feast to the eye. The UMi Max does not only look beautiful, it also has a sturdy and resilient feel. Equipped with a Gorilla Glass 3 screen this beauty can take a hit and is capable to deal with the harsh environments of everyday life. Thanks to its close-fitting curved back cover this cell phone is capable of holding a massive 4000mAh battery while keeping a thin and slim body. Its enormous battery provides you with up to a staggering 20 hours of continuous usage time, far outperforming similar range smartphones. With such a battery under the hood you no longer have to worry about running out of juice as you will now be capable of enjoying all your favorite apps, games, and more in full-HD quality without the need to recharge your phone on a daily basis. Having the possibility to insert two 4G connectivity SIM cards at once provides you with a perfect platform to carefully divide work and private life while using merely one device. Its double IMEI number additionally allows you to easily switch in between SIM cards and networks, guaranteeing you that with the UMi Max you will never be out of reach. The UMi Max comes with a 12 months warranty, brought to you by the leader in Chinese smartphones as well as wholesale electronic gadgets.. Excellent product at very good price. DHL Delivery not so fast.